It's been said that most of us are first attracted to our partners by their looks. The first thing we notice is the appropriate 'equipment'. Only afterwards, once the "Oh wow!" factor has moved into background noise, do we start selecting information and impressions from the higher sciences, like intellect, the emotional landscape; those things that hold us together throughout the years (hopefully). I have to admit the "Oh wow!" factor for the BassLab STD-V is very high. When you first open the soft shell case, that element hits you right away. The model we reviewed had a blue/purple finish with a subtle metal look to it. In fact, even the fret board and every neck and body part except the hardware was that color. It was a slightly overwhelming effect. If you are like most of us, you have spent the bulk of your experiences in playing bass wrestling with body size and weight when making considerations as to whether to buy or not to buy. Particularly if you are a 5 or 6-string player, you can often be literally weighing all the factors, including the size of the instrument. With some of the more massive 5 and 6-string wooden basses you have to ask yourself if you feel you could handle carrying around something this heavy for a whole evening. Certainly a good wide strap helps, but even with that taken care of, you still have to consider the act of physically carrying this bass around the stage for one long time. With the BassLab STD-V, that factor is moot. Weighing in at a fraction of its peers (approx. 2.6 - 3.0 kilos depending on the model), with its thin body and narrow ergonomic wasp-like waist, there is a strong sense that this instrument was designed not only to be an attention-getter, but also to be comfortable to play. The body is not fashioned from wood. In fact, there is not one piece of wood in or on the instrument. Right about now I can hear doors slamming all around the world. But, one thing must be whispered through those door jams: "Sound". Yes, sound. That all-important factor that should be your first consideration. At the end of the day, this is not a beauty contest. This is about music, sound, art. 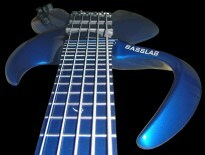 In this arena, the BassLab excels. To be completely candid, this thing sounds waaaaay better than one would think it should. After all, this is not wood! This is not the concept we grew up on. It has a shape that would inspire most teenagers, but a sound that would bring an adult musician to the sweats. "Commander, there's a strange space ship approaching!" Definition in the bottom register is flawless. The mids are not nasal, so there is no ear fatigue. Tired ears are a sure sign of poor mid-range. The STD-V will have none of that! The top end is clear, just pouring out harmonics, subtle fundamental nuances and singing them out. Like an audiophile's dream of a transparent speaker, not coloring the sound in any way, this bass achieves the same end result. It simply sounds good to the ear and leaves you wanting more. One soon loses any doubt that even though this instrument may look like it was built for a testosterone driven adolescent, genuine sound is where its real strength lays. There is a wide and expressive area for tone controls, and the powerful set of pickups may add a lot to the cost of this bass. The fact of the matter is that you could easily spend this much (and more!) on 3 or 4 other basses, in endless pursuit of the tones this bass easily presents. A two-octave neck presents 24 easy to reach frets with one extra partial fret in the 25th position. When asked its purpose, we were told simple "Art". To complete and compliment the lines of the instrument. So if it ain't wood, what is it? The material is carbon-based 'Mixed Composite' brewed in a special secret recipe. The creator of the BassLab bass, Heiko, laughingly says, "We let the instrument grow! No really, we build the instrument from the inside out. When the last layer is done, we remove the kernel by a chemical treatment. The result is an instrument that consists of a few millimeters and an absolutely great resonance for low frequencies." Another thing to get used to when dealing with this bass is the fact that there is no truss-rod. It is a fact that most basses use them, and frankly, need them. It is the nature of an organic item like wood to react to stress (pressure) by bending. The BassLab does not come with a truss rod as 'standard equipment' but in speaking with Heiko Hoepfinger he expressed his firm belief that one was not needed. That even with changing string gauges, the tension produced was negligable to what the BassLab could take before reacting. He told us that he has tested this issue for years since his first prototype was finished, and found that the neck does not warp out of shape. You can bend the neck when playing to get the effect, but no matter what strings are on there, the neck is, according to Heiko, not going to permanently bend. However he did say that he is considering the idea of offering a truss-rod as an option, but only with a mind to meeting the concerns of customers who are sceptical of doing without one. Also it is difficult to integrate truss rods in this kind of bass, taking into mind the unusual method of construction. He says that it also interferes with the strings and transfers the resonance frequency of the neck, because it is not 100% swing-free. To date BassLab has never had any complaints about warped necks. Operating under the philosophy that "If it ain't broke, don't fix it", they felt it to have too many negative aspects to make it part of the regular production setup. Compounded with this, Heiko feels that the whole concept of his basses does not naturally lend to 'foreign objects' like a truss rod being added to the neck and body. When we opened up the back of the instrument, the soldering was clean, the wiring was laid out well, the pots were solidly seated in the cavity, all seemed in order. It was rather odd to be able to tilt the bass and look even further up into the hollow body of the bass. Our only beef with the layout of the controls lay in the fact that in a seated position one could possibly accidentally trigger the mute position on the volume knob. If you are out there doing the obligatory 'acoustic' set, don't move around too much. You may just become more acoustic than you might like by bumping this potentiometer in error. A 'pull' to activate knob would solve this, instead of the push knob presently installed. Easily solved. One of the many positive aspects of the bass, an indication of how well he has thought the whole thing out, is the option of a passive/active knob on the bass. If in the rare case you kill the battery that runs the active function during a gig, you merely click on over to the passive role, and business as usual! Our test model had something called 'Rough Crystal' Pickups. These provided exceptional clarity and volume, with some of the nicest midrange we have heard to date. The bottom register seems to provide an attention to detail not often heard. No matter how much bass tone we tuned in, it would not waffle or warp the sound wave. This bass oozes bass! For those who have grown fond of other pickups however we were told that custom pickups of any sort can be substituted. The options for these basses cover a large area, brass, gold, silver hardware, any pickup combination you would like and tons of other options. 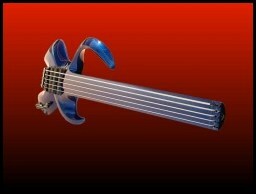 You can be involved in the design of your bass as well. The lead time (build time) is around 8 weeks unless the bass you want is in stock. Active and passive controls. Wide range in sounds with broad-range tone controls. Installed pickups were some of the most powerful and pleasing to the ear we have heard. Disconcertingly light and easy to handle, narrow neck for a 5-string. Ideal for the lighter frame and easy on the shoulders for anyone. Our testing bassist commented that, "You can just concentrate completely on playing. You no longer need to even think about managing the bulk or the mass of the bass." Mute button could be engaged accidentally in the sitting position. Perhaps moving the Mute button to the end of the bottom wing of the bass would solve this, or changing it to a pull knob instead of a push to engage the effect. Easily enough resolved. Unusual body shape might not be for everybody. The more exotic shape could look a little silly on a 50+ bassist, but BassLab even has a traditional P bass to cover that eventuality! I was very hesitant to give such high marks, not wanting to start the marks too high and ruin credibility, but the bass deserves such high marks and so does Heiko. Overall, the positive items on the bass far outshadowed any hesitation we may have about playing a non-wood intrument. In the end, it was a bit difficult giving the instrument back, it was that good! Body and neck: Lightweight hollowbody carbon-based material, body and neck are one piece, and the neck is also hollow. Neck 34" scale and 24 frets. Electronics: active BassXX pre-amp, custom-made to BassLab's specifications, three-band-EQ: 2xVolume (front one with mute push button); double-potentiometer bass/treble with active/passive switch; mid-gain; mid-frequency. Battery: 1 x 9 Volt. Note: Our test model had a little LED between the two pickups that will flash when the battery starts to fade... . Mechanics: Black hardware. Bridge and Tuner ABM. As usual for a headless bass, the ABM tuners are located at the tail of the instrument. Normal (single-ball) strings are used, with the free end clamped at the head and the excess string trimmed off. Options: Custom instruments can be created with any combination of tuners, pickups, and electronics, and also variable neck profiles, body shapes, and lacquer colours. Typical options are: 4, 5, or 6 strings, fretted or fretless, headed or headless, BassXX or DaCapo pre-amp, 2 or 3 pickups, colour. Weight: approx. 2.8 kgs (6.2 pounds). Depending on the model the weight varies from 2.6 to 3 kgs (5.7 to 6.6 pounds). There are actually two versions: light and heavy. Our test model was 'heavy', which is the standard and more for the rock-bottom sound, while the light version has a more acoustic and mid-range Sound. Copyright © 2002 by Bass Inside Magazine. For comments on this site contact Webmaster.